With 102 degree weather in the Northeast this week, there's no denying summer has begun! Summer has always been my favorite time of year. When I was a kid, there was nothing I loved more than the long summer vacation from school where I was free to lounge around all day, watch tv, play outside, go swimming, catch fireflies, eat ice cream, and enjoy all of the other wonderful things summer has to offer. There was so much I wanted to do and all the time in the world to do it! Ah, it was wonderful. Unfortunately as an adult the days of 10 weeks of summer vacation are gone. But this doesn't mean I can't still enjoy summer, I just need to make the most of my free time. 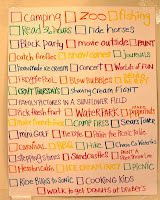 So when I saw the Summer Lists Kimba and Meg put together for their kids, I totally fell in love with this idea. 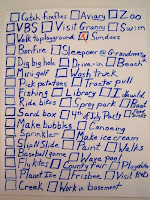 They made a colorful list of all the fun things their kids want to do over summer break. I may not be a kid anymore, but I still love summer and couldn't resist putting together a grown up version of this summer to do list with my hubby! Summer is all about acting like a kid again, right? To make my own adult version of this summer fun list, I typed up a list of fun summer things we wanted to do in Powerpoint and printed it out. I made the list colorful and used a fun font, Algerian. Once printed, I put our summer list in frame I already had (bought at the dollar store a few years ago) and took out the glass so we can check off our fun accomplishments as they happen (you can also keep the glass and use a dry erase marker to make check off the items on the glass). Now whenever we're out of things to do, or I'm simply down from being stuck at work all day, we can consult our summer to do list for fun ideas. As a bonus, once summer is over we can hang onto to this list as a souvenir to remind us of the fun we had this summer. Rob and I have already checked off several of our fun to do list activities already. What are your plans for summer? Do you have a list of fun summer things to do for yourself or your kids? This project is shared on Finding Fabulous, Inspired Room, Finer Things, Make the World Cuter, Sumo's Sweet Stuff, Skip to my Lou, Creative 2xmom, Craft, Topsy Turvy, Tip Junkie; stop by to check out the other great projects featured! Love it! I'm off to make a list of my own! How cute! I like the idea of putting a list together, it's goals to be accomplished! Yay! What a super cute idea!! I have never seen these and love how yours turned out. Thanks so much for the inspiration! I'm featuring this on my blog today! Come on by and grab a button! Love it! Can you tell me how you did the boxes? I'm trying to do it by inserting a table, but I'm having some issues. Thanks! What a great idea! We made a list too! Maybe we will make a new list for the school year and do something like this! Nikki, I used Powerpoint for the list. I used the square shape tool to draw each check box. Each of the activities I wrote inside of a separate text box and just made sure to space them evenly so they were lined up nicely. Hope that helps!